There have been a lot of stories this week about the Wisconsin Department of Natural Resources and their concern over grunerite which might be an environmental hazard at some mines in Wisconsin and the Iron Range of Minnesota. Grunerite is a rare mineral described as "asbestiform" or like asbestos. It is found most often in a crystallized form, but can also be fibrous, like asbestos, when it is called Amosite. Grunerite was named after the chemist Emmanuel-Louis Gruner, who discovered it in 1853. It has been mined in South Africa as asbestos. If it's so rare, why is Grunerite in the news? 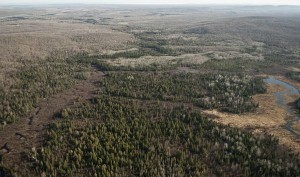 A company in Wisconsin is sampling in preparation to mine in the area and the Department of Natural Resources (DNR) is taking seriously the risk that fibrous grunerite could be released into the environment from mining operations in the Penokee Mountains or even just from sampling if proper care is not taken to prevent it. Release of these fibers would endanger not only the people in the area, but especially the workers in the mine itself. The DNR is looking into the minerals in the area of the mine as well as what plans the mining company has for dealing with waste from mining operations if what they find there is dangerous to human health. There is no safe level of exposure to any asbestos or asbestos-like mineral. Health problems can take years or even decades to present, but they can be dire, even fatal. If you have asbestos-containing materials in your home or other building, do not remove it yourself. Even one exposure to these tiny fibers could cause cancer or other asbestos related disease in you or your family. Contact Alliance Environmental Group for help safely removing and disposing of asbestos in: flooring, sheet goods, pipe insulation, siding, roofing, duct work, stucco, drywall, ceiling tile, popcorn ceiling, plaster, buttonboard, fireproofing and other products. Removing asbestos is NOT a DIY project! Protect yourself and protect your family!